The debate over salmon farming impacts continues to rage in BC and is largely perpetuated by government and industry. The industry regularly dismisses new science that suggests salmon farming is harmful to wild salmon, or the environment, and is quick to label conservation groups as “anti-salmon farming.” Governments are just as quick to maintain the status quo and insist that current management of the industry is more than adequate. It’s no wonder that people often feel confused when trying to make an educated decision about what to buy at their local grocer or restaurant. However, if you look more closely at the peer-reviewed, published science on the issue, the picture becomes clearer. The weight of scientific evidence clearly shows that open net-cage salmon farming does negatively affect wild salmon and has an impact on the surrounding marine environment. 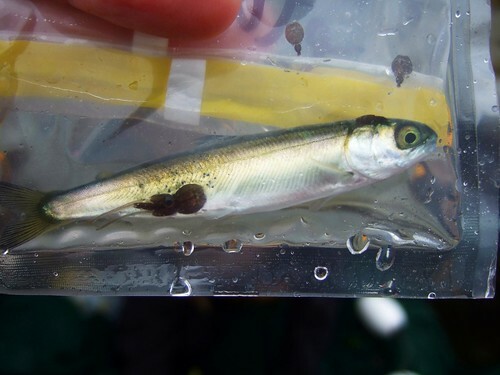 Sea lice and disease transfer between farmed and wild salmon, competition of escaped farm salmon with wild fish, and pollution from salmon farms are serious impacts. The salmon farming industry also affects global stocks of food fish used to make feed pellets, and has economic impacts and conflicts with the BC commercial fishing and tourism industries. The truth is that many groups, like Watershed Watch, are not “anti-salmon farming” at all. We simply recognize that the current way of farming salmon is only working for one group—the salmon farmers. Major changes need to be made to protect BC’s wild salmon. In an effort to make these changes Watershed Watch works with like-minded conservation groups and individuals, government and industry to further study the impacts open net-cage salmon farming is having on the environment, as well as to look for potential solutions. Currently, the transitioning of salmon farms to closed containment systems offers the most straightforward way to solve many of the problems associated with open net-cage salmon farming.